This is to be the first in a series of posts in the run up to Thanksgiving Day here in the US. So what better to be thankful about than new puzzles to play with? You'll have to indulge me for a few minutes here, as this set of puzzles comes with a bit of a story. Don't worry, there's puzzles in here too! So back in June, my parents came to visit me here in California. It's the first time they've traveled since my dad went through all his Cancer operations, and it was the end of a long road for him. Both he and my mum were in need of the break, and having not seen them other than the quick trips back to Scotland for work, it was the perfect time to catch up. While they were here we had planned a bit of a road trip. None of us (either my parents or my new family) had been to the Grand Canyon or Death Valley, and since it was likely to be the last time my parents would be able to make such a long trip, we took the 2000 mile round trip in an RV. 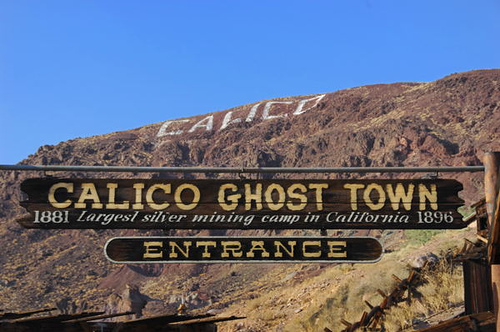 While we were in Death Valley, we stopped at an old Ghost Town by the name of Calico. 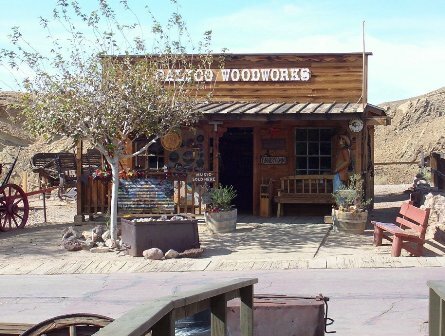 This is an old silver mining town which has been restored and has the tourist trap costumed inhabitants wandering around. One of the shops there was a modestly sized Puzzle shop; Calico Woodworks, selling 'old west' puzzles, including various disentanglement puzzles, tavern puzzles and wooden puzzles. I must have spent an hour in the shop (much to the dismay of the rest of the family who wanted to see the town) browsing, and talking with the owner, who had a fantastic knowledge of the puzzles she was selling. As it happens, we struck up quite the little banter, and I have no doubt our discussions helped her sales for the day as the shop was packed when I left. Not long after I walked in, and I was animatedly pointing things out to Jen and my Mum, she hands me a puzzle which she calls the 'Manhood Puzzle". Clearly its something she hands to all the men as it comes with a story that if I can't solve it, she'll have to change my name to something girly. The puzzle she hands me is a nut and bolt puzzle, which as it happens I've seen before. I play along for a minute, and poke and prod at the split washer which is secured in the middle of the screw between the head and a nut which is soldered to the screw, before unscrewing the bottom section and removing the washer. She then picks up a few other puzzles to show me, and entice me into buying. As she's off finding the puzzles, I spot a two piece pyramid puzzle sitting on the counter, and promptly solve it. (After all it was sitting there un-solved!) She comes back, spots it solved and asks if I did it. "Yes", I reply. She curses me, then proceeds to tell the story of having received it from Creative Crafthouse, spent days not being able to solve it (having received 1,000 of these), and calls them telling them their puzzle is broken. When they told her how to solve it, I believe a large chunk of pride and humble pie was swallowed! She picks up a series of three puzzles, which for the Shippers Dilemma series. It turns out these are made by Creative Crafthouse and come both individually and as a nice set of three. As it happens, she didn't have the first in the set available, but I did end up buying the other two puzzles from here (amongst other things). So now that I'm done with my story, back to the puzzles at hand! The two puzzles I ended up getting are Shippers Dilemma 'Y, the middle difficulty puzzle, and Shippers Dilemma 'Z' the very hard puzzle. 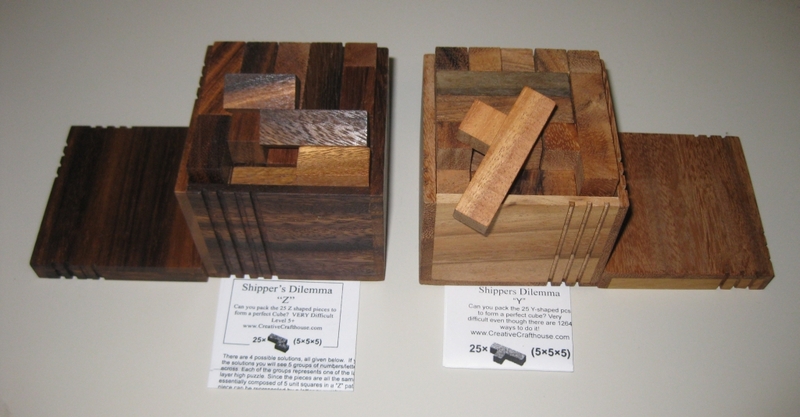 Both puzzles come in their own wooden boxes, which have been routed with a number of grooves to signify the difficulty of the puzzle. It's a nice touch and means you can easily tell which puzzle you're picking up without having to leave the lids off! Also, the 'lid' is really the base, and the puzzle can be built inside it then the rest of the box slipped on top to put it away (that is if you get it back into a cube)! The first of the two puzzles is made entirely of 'y' shaped pieces, 25 to be exact, which have to be placed together to make a 5x5x5 cube. The puzzle was designed by David Klarner and published in the Journal of Recreational Mathematics in 1970, so its not a new puzzle. Originally thought to have just 236 solutions, Burr Tools shows there to be 1264 solutions possible. Never the less, this is still a challenging puzzle, and it's unlikely you're going to solve it in 5 minutes. I think I played around for about 30 minutes to get one solution, and was happy enough with that. There are a number of other shapes that you can make from the pieces, including a 10x5x1 rectangle from 10 pieces, and a 15x4x2 using 24/25. So lots to keep you occupied with this particular puzzle. It does come supplied with a solution sheet showing 4 possible solutions, and the other shapes you can try, so if you're struggling with the 5x5x5 then one of the others may prove easier! The pieces of the puzzle themselves are unfinished and fairly rough. While the fit is fairly precise between pieces, there's evidence of glue on some of the pieces, and not all the small cubes are glued perfectly straight onto the longer 'base' section. That said, this isn't an expensive puzzle, and given that it's well worth the money. The second of the two Shippers Dilemma puzzles is 'Z'. You'll not be surprised when I tell you that this puzzle is made from 25 'Z' shaped pieces (or N in pentominoes sets) which need to be made into a 5x5x5 cube. Like it's little brother there are a number of other possible solution shapes using varying numbers of pieces which are listed with the puzzle, so again plenty to keep you occupied. This is listed as a very hard puzzle, and given that there's only 4 solutions, which are provided, I can see why. Around an hour found me a solution that let me put it back in its box, and I was pretty happy with that. Burr Tools confirms that there's only 4 solutions. 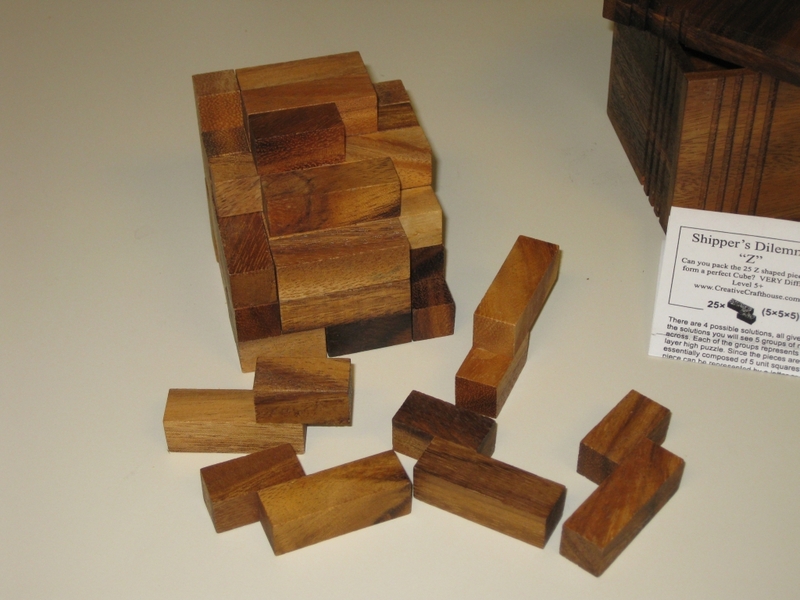 This puzzle is made from a darker wood, but again, I'm not sure what sort of wood has been used. It's of a similar quality and price to the previous puzzle, so all in all good value for money and a serious challenge regardless of how many times you solve it! I may have to puck up the first in the series, as it has a beautiful symmetry to the way the pieces fit inside, which I really liked. That's one for another day though. Funny that I traveled all the way to Death Valley to pick up my first puzzles from Creative Crafthouse, but I've not been disappointed, and will likely buy more from them in the future. Come back tomorrow to see the other puzzles I picked up while in Death Valley! 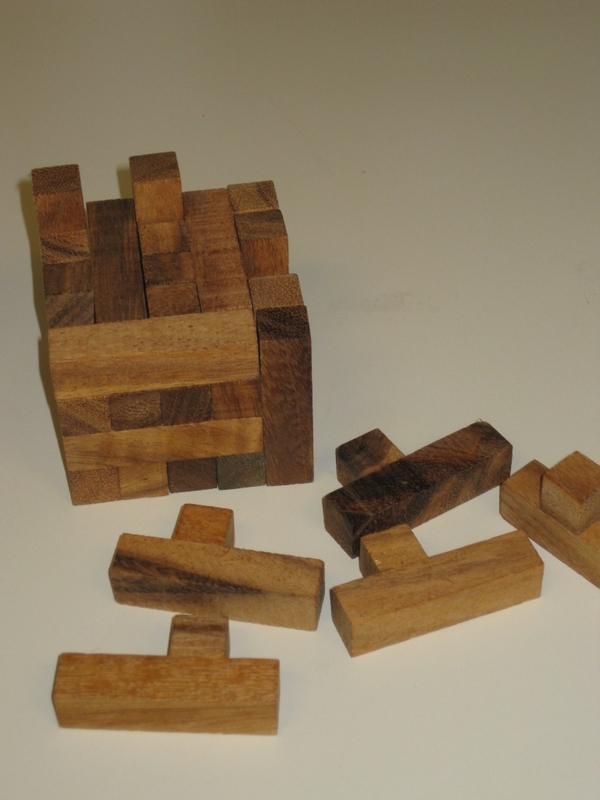 God I hate it when you review puzzles and tell me where I can get them online…..another one ordered. Thank you very much. Always happy to help share the pain of a new puzzle found! Yikes, Death Valley in June! I’m surprised you weren’t cooked. Wasn’t it roasting hot? Somewhere between 117 -124F while we were there. Pretty hot, but with plenty of water, and AC in the RV, we were just fine. On a whim I once took a side trip to Death Valley in June. We were in a car with no A/C, and when we arrived at 11PM it was 98 degrees! We got right back into the car and drove to Las Vegas, where it was probably 15 degrees cooler! Got one for the kids yesterday… and guess what ? I can’t stop playing with it :). Thanks for the tip and congratulations on a great blog.